Last Thursday, I stayed up until just after 3:00am to pre-order an Apple Watch. From my phone, I ordered a stainless steel model, which is scheduled to arrive between April 24th and May 8th. I’m looking forward to it. Though smartwatches have been around for years, event technology companies have finally been put on notice. 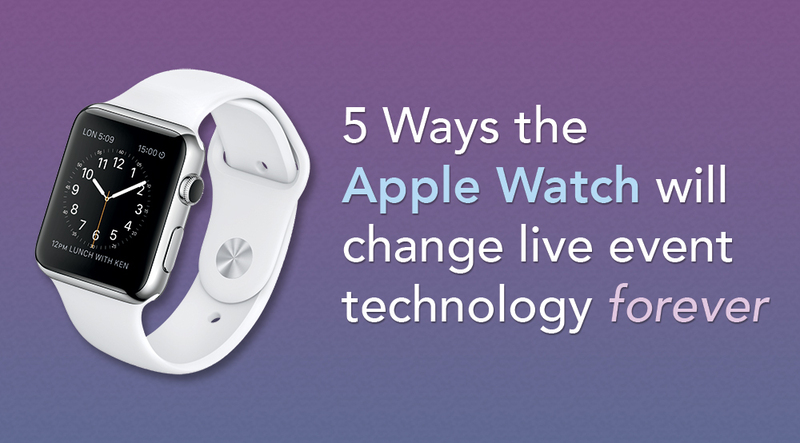 Apple’s brand and marketing power can tilt smartwatches into the mainstream. As we start seeing these devices proliferate at events, we are going to need to know how to leverage them. We will only be successful so long as we can create better experiences. Creating better meeting experiences is why we built Conferences i/o, the world’s premier live audience engagement platform (sorry, had to plug it), and for a while now we have been thinking about the impact of smartwatches. Many of the things a smartwatch can do, can also be accomplished with a phone. So we have focused on high-impact moments where someone might be rushed, struggling with a more complex interface. A smartwatch’s tiny display, while in one sense a limitation that reduces the scope of what users can do, will actually be a beneficial constraint because it requires simple interaction. Smartwatch apps will be easier to use because developers won’t be able to hide behind interface complexity. Let’s look at a few ways smartwatches can impact events. Similar to NFC payments, attendees could hold their smartwatch next to a registration terminal. Identifying information is passed, and attendees are instantly registered. Why not just take your phone out? Long registration lines can be overwhelming, and in the stress of the moment you can easily fumble with your phone’s security code, or struggle with the thumbprint. At large events, finding your meeting or breakout room is hard enough, as you have to wade through a sea of fellow attendees. Now imagine your smartwatch giving you simple navigation through the halls. There are a few apps available that push the limits of networking. Imagine an app that grabs your professional profile, lets you pick out people that you would like to talk to, and then either coordinates meal meetings (with a homing beacon), or alerts you when you are physically nearby. Like event notifications, you might not notice your phone if it’s in your bag or pocket, but you will certainly feel your watch’s haptic feedback. I’d be remiss if I failed to mention the nearly unlimited ways smartwatches can impact in-session audience participation. I think the greatest benefits will be for presenters and session moderators. Smartwatches can literally measure your heartbeat, so they are a natural fit for receiving notifications and glances on the pulse of your audience. Having so much experience seeing our technology used at events, we’ve got some great ideas here. Smartwatches can impact events in many ways, but these impacts circle around a few key themes: glances, notifications, and proximity. As we see smartwatches showing up in ever-greater numbers, we should be thinking about how we can leverage them to create better experiences.